Image: Dorothy Stevens, Helen Agnes Newton Lawson, circa 1945-1952. Pastel on Canvas. Collection of Museum London, Gift of the Lawson Family, 2004.
International Women’s Day is on March 8th and this year’s theme is #MyFeminism. I wanted to spotlight something from Museum London’s collection to recognize women’s achievements. In this one piece, the lives of two extraordinary women intersect: the sitter, Helen Agnes Newton Lawson (1887-1977) and the artist, Dorothy Stevens (1886-1966). Let’s start with Helen Lawson, about whom little has been written. Documentary evidence tells us that she was the daughter of an Anglican clergyman, Frank Newton, and his wife, Mary. In 1909, Helen married Londoner Frank “Ray” Lawson, son of Frank Lawson of London’s Lawson and Jones Limited. She helped him weather the difficult years of the First World War (1914-1918) and later survived the economic hardships of the Great Depression. Helen’s public role as the wife of an influential businessman was to be a gracious hostess and guest. Behind the scenes, she ran their home and helped raise their son, Tom. During Ray’s tenure as Ontario’s Lieutenant-Governor from 1946 to 1952, Helen continued to host events but on a far grander scale. As a glance through the Globe and Mail electronic archive shows, Helen hosted and attended countless official events. At this moment in time, she may not have had a title but she worked as hard as her husband who did! It was during this period that Dorothy Stevens painted Helen Lawson’s portrait. Celebrated Canadian artist Dorothy Stevens figures much more in the historical record. Born in Toronto to Benjamin Stevens and his wife Bertha, Dorothy began her artistic training when she was 15. She studied in England and France, developing an interest in etching. In 1914, Dorothy was proclaimed the “most brilliant etcher Canada has ever known.” During the First World War, she participated in the Canadian War Memorials Fund, one of four women out of the 20 artists in the program. Her prints of men and women working in munitions plants, airplane construction, and shipbuilding received critical acclaim. After the war, Dorothy built up her already-established reputation as a portraitist. Her depiction of Helen Lawson is beautiful evidence of this. 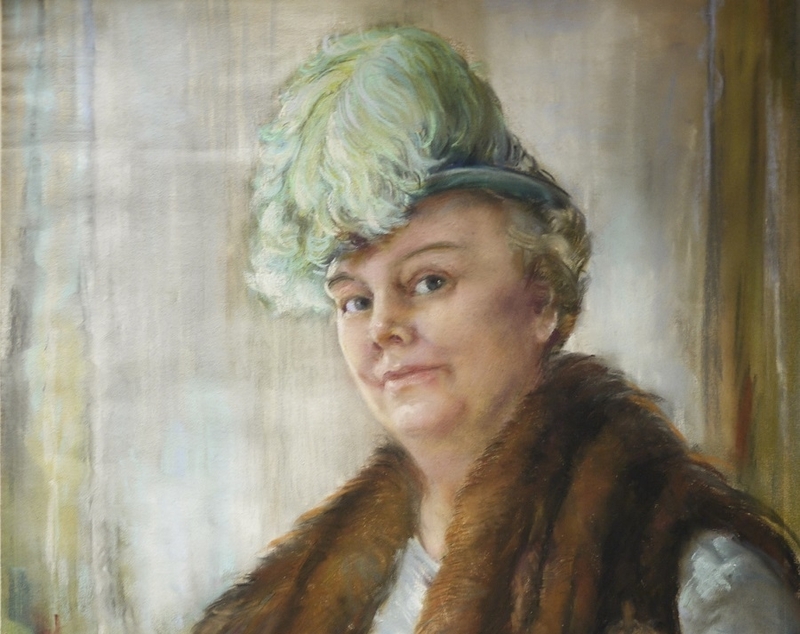 As with her portraits of other Canadian women of “more than average charm,” Dorothy captured Helen’s “beauty and vitality on canvas.” She depicts Helen in formal attire, the elegant clothing and accessories she wore when Ray donned his Lieutenant-Governor’s court uniform. As beautiful as it is, this was Helen’s work wear and she was a working woman of whom much was expected. Dorothy’s depiction leaves no doubt that Helen delivered. Her direct look and slight smile suggest a confident woman of conviction and humour, a woman who knew her own worth. It seems to me that we get a far better feel for the kind of woman Helen Lawson was from this portrait than we do from any other source. Both artist and sitter are excellent women to recognize on International Women’s Day. Helen Lawson and Dorothy Stevens lived very different lives but both contributed their utmost in their respective endeavours. For this reason, they both deserve to be recognized and remembered today. Margaret Bell. "Women and Art in Canada." Everywoman·s World (Toronto). June I 914, p. 15. Eva-Lis Wuorio. “Careers for Women: Dorothy Stevens Captures Personality in Painting.” Globe and Mail (Toronto). May 30, 1946, p. 11.